The majority of iOS users prefer iOS games that are available for free and supported with advertisements, according to a new study conducted by Wild Tangent in collaboration with analytics firm IHS Technology. The survey, which queried 500 iOS users, saw 86 percent of respondents state that they prefer free games with ads over paid games without ads. Broken down, 70 percent of respondents preferred free games supported by advertising, while 16 percent were in favor of freemium games with the option to pay for levels. Just 14 percent of those surveyed preferred iOS games that required money upfront to download. When asked about their preference for the types of games online gamers preferred, advertising supported games were chosen by the vast majority of those surveyed. 70% of respondents said they preferred free games supported by advertising and 16% preferred freemium games with the option to pay for levels in the game. Only 14% preferred online games they had to pay for to play. Gamers also prefer advertising models that give them control over their viewing. When asked if they prefer games that let them choose when and how to view ads over those that do not, 71% preferred that level of control. Gamers also overwhelmingly preferred value exchange ads within freemium games, which allow users to play videos or view other advertisements in exchange for in-game currency or items. The recently released Disco Zoo provides a good example of such a system, rewarding players with in-game Bux for viewing short videos. 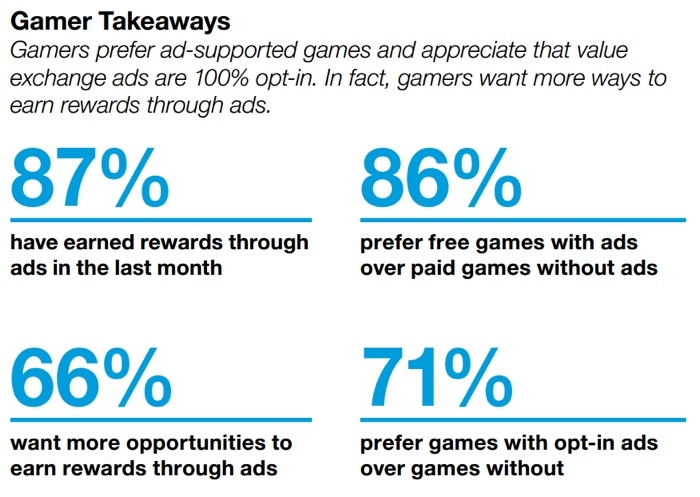 The addition of free in-game items acquired through advertisements boosted time spent within games by approximately 28 percent. Over the course of the last several years, freemium games have largely replaced paid titles as the standard in the App Store. As of today, 43 of the top 50 apps listed on the App Store's Top Grossing chart are freemium gaming titles. Several others are non-gaming apps that offer in-app purchases, and only one paid game, Minecraft - Pocket Edition is ranked as a top grossing app in the number 18 spot. Some of the most popular freemium apps in the App Store, like Clash of Clans and Candy Crush Saga, have generated millions of dollars in revenue. Clash of Clans, for example, is said to earn approximately $1 million per day through add-on content, booster packs, and more, while Candy Crush Saga earns upwards of $834,148. In comparison, Minecraft - Pocket Edition is estimated to be earning $60,000 per day -- not exactly small change, but nowhere near the revenue popular freemium games can bring in. Given the sheer amount of money that freemium and free games supported with advertising make for developers, it is not surprising that the freemium business model has largely taken over the App Store. According to IHS, by 2017, only 10 percent of mobile and tablet gaming revenue will be generated by paid downloads, with the rest of revenue coming from ad-supported free apps. Today, approximately 15 percent of gaming app revenue comes from paid apps, with 85 percent being generated through in-app purchases. A survey of MacRumors audience would probably differ greatly. I can't stand adverts in games, and don't mind supporting a developer for a game I really enjoy. Add me to the other column please. Really? A company with an ad platform says that iOS users overwhelmingly prefer free games with ads? And the sample size is only 500... were they employees of WildTangent? People are so disappointing, aren't they? What I like are when apps are free with Ads, then they have an inApp purchase option to remove the Ads. I like it because then I get to try the app out "risk free" then basically pay the developer if I like their app. I really stinks to have a paid app without a trial version, only to find out it isn't what you needed or wanted. It took research to find out people prefer FREE things? Just get rid of in-app purchases for good please. Also, has anyone tried the free version of Angry Birds lately? Every 10 seconds you have to watch a video ad!! Had to delete it straight away from my Mum's iPad. The worst case of ads in a game that I've ever seen. Count me among the minority. I loathe seeing advertisements. Not me. I find that crap highly annoying.